“They’re running out of table, exactly like I said they would, in the best way possible,” Jersey Shore creator SallyAnn Salsano announces in the actual Staten Island basement-turned-production control room of one of her stars, Vinny Guadagnino. Upstairs, Guadagnino and the rest of his MTV cast — slowly reformed outcast Angelina “Dirty Hamster” Pivarnick included — are filming a new holiday special, “A Very Jersey Friendsgiving” in a sprawling dining room. Downstairs, amid the clatter of the production team’s typing, there are American Gangster and Reservoir Dogs movie posters on the wall, countless boxes from Staten Island’s best bakery, Alfonso’s Pastry Shoppe, on the table, and a drawing of rockabilly Audrey Hepburn giving rockabilly Marilyn Monroe a tattoo hanging over the basement bar. This is Jersey Shore Thanksgiving. Of course MTV’s most iconic crew is running out of space in the dining room — Guadagnino’s mom, the tirelessly doting Paola Guadagnino, led the 15-hour Thanksgiving meal charge with a little help from the production team. Paola cooked 299 pounds of food. The extremely packed scene perfectly captures what is so special about MTV's “Jersey Friendsgiving,” premiering November 15. It is both utterly, relentlessly ridiculous and still filled with the kind of palpable, authentic love that can only be fostered over a decade of family-style reality TV. The upcoming 2-hour special essentially runs as both a peek at the holidays Jersey Shore-style and a clip show. Between all the mangia-ing, cackling, and playful roasting stuffed into the Friendsgiving spectacular — you know, the chaos we’ve come to expect from this posse — the cast takes a walk down memory lane via nostalgia-fueled video packages producers have put together. That means the fans at home will get to watch all the casts’ cringes, shrieks, and “Awwws,” as everyone, save for Sammi “Sweetheart” Giancola, is reminded of their wildest moments from days gone bye. Yes, Deena Cortese stripping during her first day on Jersey Shore is there. Yes, the previously unheard origin story of DJ Pauly Delvecchio’s “Cabsahhere” catch phrase is there. Yes, the Mike “The Situation” Sorrentino-Sammi Sweetheart-Ronnie Magro-Ortiz love triangle drama is there. Even The Letter is there. Despite how awkward some of filming “Friendsgiving” will be, it’s also undeniably clear how close this cast actually is, even when the cameras are off. Considering the timing of “Friendsgiving’s” mid-October filming, the entire day feels especially poignant. Farley, who is now reportedly “working on things” with husband Roger Mathews, filed for divorce two weeks earlier. Sorrentino, whose legal woes have been a major specter over the Family Vacation proceedings, was sentenced to prison a mere week earlier. Magro has experienced a rollercoaster of a year with girlfriend Jen Harley, which his reality show has heavily documented. Yet, there they all were for Friendsgiving, laughing for hours on end, even when a cameraman wasn’t in the room. This real love disproves any lingering speculation that this show is scripted in any way, or that producers coach the cast.. “You can’t fake 10 years, I’m sorry. You can’t do it,” Delvecchio announced. 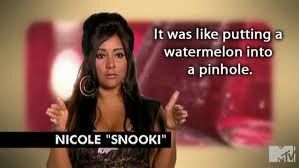 The fact that JWoww struggled to properly introduce a single clip package for three full minutes during filming is proof of that. The 2-hour A Very Jersey Friendsgiving special airs Thanksgiving Day at 3:40 p.m. on MTV.